Range: Circumboreal; Labrador and Greenland to Alaska, south to the mountains of Maine, New Hampshire, Vermont and northern New York, on the summits of the higher Alleghenies to North Carolina, and to Michigan and Washington. Also in Europe and Asia. 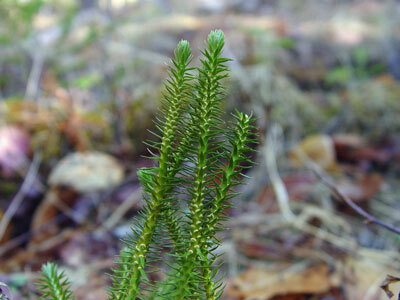 Aids to Identification:Northern firmoss is similar in appearance to some other, more common, firmosses. Its dense, leafy stems grow 5-10 cm high, in close tufts, giving the clumps a flat-topped appearance. 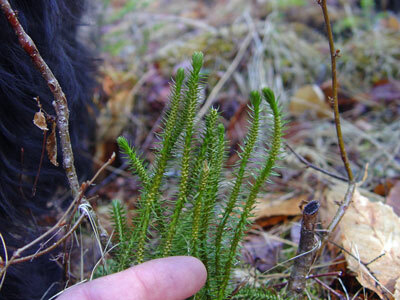 The scale-like leaves bear the sporangia (spore-producing bodies) in their axils, so that the yellowish spikes characteristic of most clubmosses are lacking. Huperzia selago is very similar to H. appressa and the two species are very difficult to separate. H. apressa has smaller, more upward oriented leaves and determinate stems (i.e., the entire stem dies and turns yellow). H. selago has larger, more spreading or recurved leaves and indeterminate stems. Ecological characteristics: Huperzia selago is not an alpine species, contrary to previous thought. Popular sites for H. selago in New England include disturbed sites near water, such as shores, ditches, and coniferous forests. Hybrids with H. appalachiana are frequent above treeline on New Englands higher alpine summits. But H. selago is not found above treeline. Phenology: Sporates July - September. Synonyms: Lycopodium selago L.; Lycopodium selago L. var. patens (Beauv.) Desv. ; Plananthus selago (L.) Beauv. ; Urostachys selago (L.) Herter. Known Distribution in Maine: This rare plant has been documented from a total of 9 town(s) in the following county(ies): Franklin, Kennebec, Oxford, Piscataquis, Somerset, Washington. Reason(s) for rarity: At southern limit of its range. Conservation considerations: Populations could be threatened by heavy recreational (hiking) use.